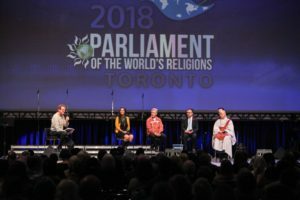 This November 1-7 in Toronto, over 7,000 people from around the globe gathered for the Parliament of the World’s Religions, the largest and oldest interfaith gathering of its kind. The Parliament included six tracks, each with its own three-hour assembly session, on Indigenous Peoples, Women in Religion, Climate Action, Justice, Countering War, Hate & Violence, and the Next Generation. We at EcoCiv had the distinct pleasure of planning and implementing the Justice Assembly and cultivating many of the breakout sessions included in the Justice Track. Organized into three parts or movements, the assembly focused in the first hour on understanding types of injustice and the interconnection among them. In the second hour, we discussed reconciliation and how reconciliation might look in the face of an unjust past and present. Philip Clayton leading a panel discussion during the Justice Assembly with thousands in the audience. Finally, the third hour moved toward action and concrete change for a more just, peaceful, and sustainable world. Each movement of the assembly included a multi-sensory approach, with panelists from around the world (and particularly from the global south) sharing their own experiences and expertise, artists painting live on stage, and performers offering spoken word and musical pieces. Keynote talks at the assembly came from Njeri Kabeberi (Executive Dir. of GreenPeace Africa), Miguel de la Torre (professor of social ethics and Latinx studies), Isabelle Alexander (professor and documentary filmmaker), and EcoCiv’s own John Cobb (process theologian and environmental scholar). The assembly closed with a strong call for an ecological civilization as a paradigm for a just, peaceful, and sustainable world. Andrew Schwartz with panelists Fr. 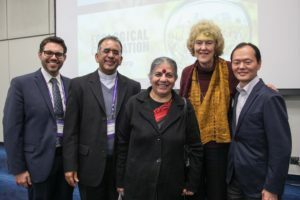 Josh Kureethadam, Vandana Shiva, Mary Evelyn Tucker, and Ken Kitatani. justice as their central theme. Two separate sessions on food justice were spawned from EcoCiv’s previous convenings on the topic. 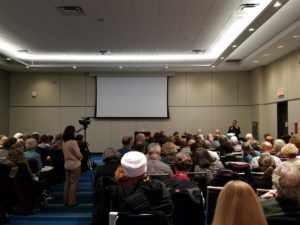 In addition, David Korten (member of the EcoCiv International Board of Advisors) organized four connected sessions on aspects of an ecological civilization, culminating in a group session featuring John Cobb, Matthew Fox, Jeremy Lent, and David Korten. EcoCiv Vice President Andrew Schwartz led a major speaker session on Integral Ecology with Vandana Shiva, Mary Evelyn Tucker, Fr. Josh Kureethadam, and Ken Kitatani. Packed house for the final session in the ecological civilization series featuring David Korten, Jeremy Lent, John Cobb, Matthew Fox, and Fran Korten. With more than 7,000 people and over 200 religious and spiritual traditions represented, the Parliament provided a unique platform describing the need for and concrete steps toward an ecological civilization. We cherish the individual connections made at the Parliament and look forward to working with many of the assembled participants on a roadmap toward a future in which life in all its forms may flourish.